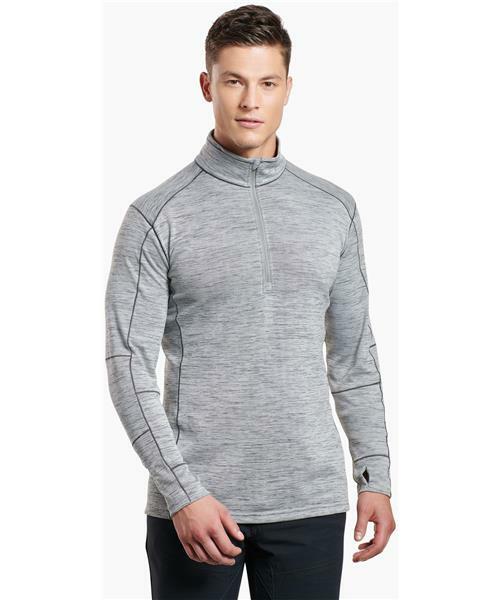 The Kuhl Alloy™ Sweater features soft, lightweight sweater-knit fabric with great breathability, wicking properties and UPF 15. The fabric has a touch of stretch for comfort. Sewn with Dynamik™ stitching for more stretch and strength than traditional flatlock, low bulk seams make layering comfortable and easy. Kuhl's articulated 5-panel sleeves provide better range of motion. The Ally Sweater features Kuhl's signature thumb loops to lock out the cold, an 11-inch reverse coil zipper with draft flap and chin guard, and an interior locker loop for storage.